Aqbat Jabr Refugee Camp - Where is Aqbat Jabr Camp Located? Before the 1967 Arab-Israeli war, the number of registered refugees was 30,000, making Aqbat Jaber the biggest camp in the West Bank. The original inhabitants came from nearly 300 villages north of Haifa, as well as the Gaza and Hebron areas. 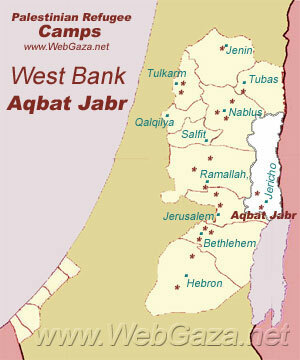 Like other West Bank camps, Aqbat Jaber was established on land UNRWA leased from the government of Jordan. Many of the refugees fled to Jordan during the 1967 Arab-Israeli war. The camp came under the Palestinian Authority’s control following the signing of the 1994 Cairo Agreement. The remaining refugees mostly originate from 22 villages, including Deir Al-Dhannam. Ajour, Al-Mismiyya, Abbasiyeh, Beit Jibrin, Tel Al Safi, Beit Dajan, Yazou and Kufr Ana. Non-refugees have also moved onto camp lands and some have illegally constructed houses there. Residents today work primarily in agriculture in the Jordan valley, or in nearby Israeli settlements. Where is Aqbat Jabr Camp Located? Aqbat Jaber camp is located 3km southwest of Jericho. While all shelters are connected to public water and electricity infrastructure, water scarcity is a major problem in this desert area. During the summer months, residents face severe water shortages which cause tremendous hardship. UNRWA is able to provide some water to the camp by pumping it from a nearby spring, though the Israeli water company Mekerot is the main supplier of water to the camp. There is no storm water drainage, and during heavy rains, water floods residents’ homes. The unemployment rate is 28 per cent and is affected by the inaccessibility of the Israeli labour market.